GaryMoller.com - Health, Fitness - Naturally! 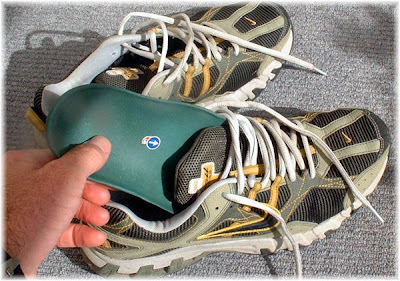 : Hallux Rididus/Limitis - should I use orthotics? Hallux Rididus/Limitis - should I use orthotics? I am a 31 year old semi-competitive runner and a police officer here in the US. I have been diagnosed with hallux limitis (stage 2). I am awaiting orthodics which I am told will take the stress off my great toe. I recently had surgery for a sports hernia which I believe is from a gait adjustment to avoid pain in my big toes. I have I have a family and have been really agonizing over giving up my running for good. However, I have implemented your massage technique today and am amazed at my increase in range of motion already. Would you suggest I still use the orthodics or just continue with the prescribed course of action on your web sight? I tried a 4 week comeback recently but had to stop due to big toe pain (causing a gait change again and painful hips!!). Any help would be appreciated. Matt, You are too young to retire from running. I never bother with orthotics which prevent the foot from working as nature intended. The nearest I go is Formthotics which are a heat moulded inner sole that supports the feet without interfering with their natural actions. My advice is to give the massage plenty of time to take lasting effect. Three months doing the massage every 3-4 days with a break in between to allow recovery before ther next session. Take a glucosamine and chondroitin supplement that has MSM added. Take the maximum dose every day for at least 3 months. Get about barefoot as often as possible, including walking in sand at every opportunity. Look for a pair of shoes that simulate barefoot running, like the Nike Free. Start by walking in them and then wear them on runs of less than 30 minutes. Resume running right away keeping within current pain limits and never running two days in a row - you must have at least one rest day between runs - even the short run - until you are completely recovered. Run a circular lap course rather than an out and back one, since Murphy's Law dictates that your toe will seize at the furthest distance from home. Run over varied terrain, preferably off-road trails. If you can't find anything suitable, come to New Zealand and train here.